"A World Ruled by Fear!!" "The Perfect Duel!" (パーフェクト決闘（デュエル）！！ Pāfekuto Dyueru!!) 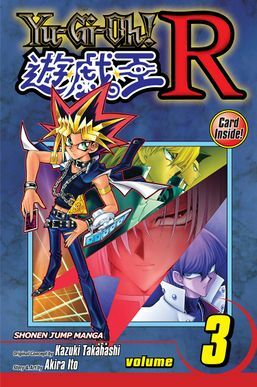 is the third volume of Yu-Gi-Oh! R.
The Japanese and English print of the volume came with a "Gorz the Emissary of Darkness" promotional card. Gekko defeats Ted, who is then beaten up by Bandit Keith. Jououchi finds the next card professor, Reiko Kitamori. Jonouchi Duels Reiko Kitamori, one of the Card Professors. Her formidable milling strategy puts his victory in jeopardy. Jonouchi defeats Reiko and Kaiba reaches Yako. Yako explains his plans to Kaiba and Bandit Keith has a confrontation with Richie Merced. Depre Scott and Richie Merced confront Yugi and Gekko. Dark Yugi entrusts the Duel to Yugi as he and Depre begin. Depre's strategy using "Cosmic Space" is put into action, and monsters can only survive with Life Star Counters. Dark Yugi believes Yugi's trapped "Toy Magician" to be the key to victory. Depre's strategy with Life Star Counters is thrown when Yugi rescues his trapped "Toy Magician". Using a combination of Spell Cards, Depre is defeated. ↑ "Yu-Gi-Oh! R 3" (in Japanese). Shueisha. ↑ "Yu-Gi-Oh! R, Vol. 3 Paperback". Amazon.com. This page was last edited on 6 October 2018, at 22:38.